Discover her eccentric sense of style. 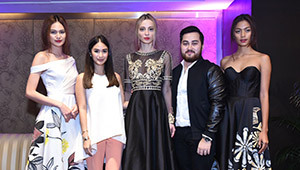 Monika Abad believes in love, fashion, and being unique. The former personal shopper left Manila for Tokyo for a blossoming romance, a change of scenery, and an affair with clothes. Her style isn't necessarily "loud" but it's different, one you simply can't not notice—especially when she decides to take her Prada platform clogs out for a strut. Below, a few quotes from this #PreviewBestDressed style shifter. "If I want it, I'll get it." "Black is my staple color and not for anything. It just is." "Except if it's for church; I'll be in something simpler, pero Yohji Yamamoto pa rin!" Read more about Monika's style story in this month's issue here.